LC Series valves are designed without elastomers and springs making them suited for applications with pulsating flow, high and low temperatures up to -100 to 900° F (-73 to 482° C) and pressures up to 6000 psig (413 bar). Lift check valves are used in chemical and petrochemical processing, hydroelectric and conventional power generation, midstream oil & gas, industrial engines and many other applications. 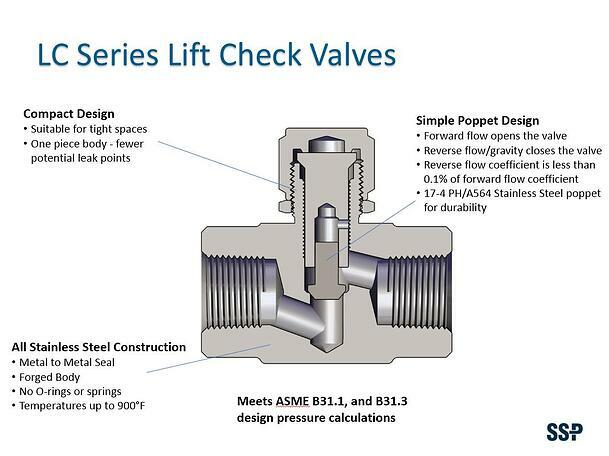 Select LC Series Lift Check Valves for your applications. End Connection Sizes: 1/8 to 3/4 in. (6 to 12mm Duolok only). Other end connection types and sizes are available. The following options are listed in the SSP catalog. Please contact SSP Customer Service or your local SSP Authorized Instrumentation Distributor for more options. Sour gas valves with materials selected in accordance with ASTM MR01-75 / ISO 15156.